Dock lines, also known as docking or mooring lines, provide a very important connection for boats – landing! Often the most overlooked equipment on a boat, having the appropriate type and lengths of dock lines on board will make your return from sea – and reconnection to terra firma - safe, efficient, and, most importantly, keep your boat where you docked it and away from other vessels. For boat renters, knowing some basic nautical terms, checking on-board dock lines, knowing how to properly use the lines, and learning basic dockside courtesies will keep your boat — and others — safe and free of dings and scrapes, or worse. Using time-tested techniques to securely dock your boat, under any weather or other condition will ensure that your boat is safe and secure and that other vessels and docking facilities are protected. Dock lines that match a boat’s length are important. Lines that are too short or not strong enough will not do the job; lines that are too long or too thick for deck fittings just get in the way. A good rule of thumb for sizing dock line is one-eighth inch of line diameter for every 9 feet of boat length. 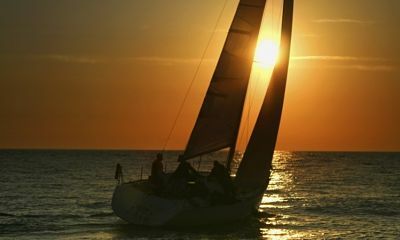 Regarding length, bow and stern lines should be about two-thirds of a boat's length; spring lines should equal the boat's length. Bollard: A short, heavy post at the edge of a pier onto which dock lines are tied. Bow line/stern line: A docking line leading from the bow or stern. Chafe: The damage caused on lines by contact with wood, steel, or concrete on docks, piers, bollards, chocks, or cleats. Chafing is reduced by using material (called chafing gear) like garden hose to protect lines from abrasion. Chock: A metal fitting on a vessel through with docking or anchor lines are led. Cleat: An anvil-shaped fitting to which lines are made fast. Eye: A permanent or temporary loop in at least one end of a line, made by splicing strands of the line in and out of itself. Fender: A cushion placed between boats and docks to prevent hull damage. Heaving line: A light line with a weighted end to which a larger line is attached, used to throw the larger line to a dock or another vessel. Pier: A structure extending from land out over water, used for landing vessels. Spring line: A line running to the dock forward from a boat’s stern, or aft from the bow; relieves tension on bow/stern lines and prevents a boat from surging fore and aft. Before getting underway, ensure that docking lines are aboard and that they are free of chafe, kinks, mold, mildew, dry rot, or excessive fading. Nylon lines are best for docking because they are lightweight, offer superior strength and stretch, and are easy to handle. If unfamiliar with a dockage, do a “float by” to see what slips are available. Better yet, hail the dockmaster via marine radio (Channel 16) for instructions on where and how to dock. Do not hesitate to ask for help if you are a novice. Make your dock approach at the slowest possible speed, with just enough headway to maintain control over your boat. Be ready to shift into reverse if needed. After deciding what side of the boat will be dock side, set the docking lines on the cleats on that side of the boat. Have a passenger tend the line and be ready to heave it to a person on the dock. If no help is available, make certain that the boat is stopped and stationary before allowing a passenger to disembark. Secure dock lines to boat cleats before approaching the dock. The best technique is to use a weather hitch knot around the cleat. When alongside, setting the bow line first is usually the best approach, followed by the stern line, then spring lines. IMPORTANT: if boating in tidal waters, check local tide tables and, when docking, allow enough slack in all lines for an ebb (lowering) tide. Not doing so will hang the boat on the dock as the water level recedes, which can seriously damage your boat, the dock, neighboring boats — and your ego! Depending on how your boat aligns with a dock, using fenders will prevent damage to the hull. Attach the fenders where the boat makes the most contact, using clove hitches in the fender lines to attach to the boat. A major part of dockside courtesy is “dipping the eye,” one of the easiest techniques to learn, and at busy marinas, almost a necessity. Dipping the eye allows boats whose dock lines share the same piling, cleat, or bollard with yours to depart when they wish, without disturbing the dock lines of remaining boats. To dip the eye, pass the loop (eye) of your line up through the eye of the other boat’s line, and then drop it over the bollard, pile, or cleat. Though the eye of your line is above the other boat’s mooring line, its position is below theirs; when the other boat is ready to leave, their line will easily lift over yours. Since your line is below theirs, the other boater simply takes their line in and departs. Nautical tradition and common courtesy suggest that when on a dock and not otherwise engaged in docking your boat, it is good form to offer to assist an incoming vessel. Having the proper sizes and lengths of dock lines on board and knowing how to use them will make your voyage, any intermediate stops, and your return to home port efficient — and safe. In addition to dock lines, it is most prudent to have on board a line of substantial length (75 to 100 feet) for use as a towline, to assist getting a disabled boat (either yours or another vessel) to a safe harbor.